From Falls City to Norfolk, Omaha to North Platte, minor league baseball has been a colorful part of Nebraska history. 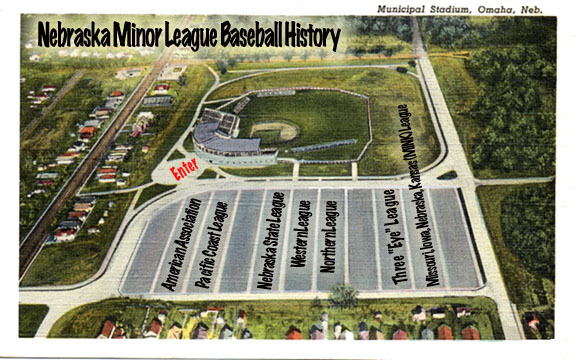 Twenty two Nebraska towns have hosted minor league baseball teams since the late 1800's. The story starts with the Omaha entry into the Northwestern League in 1879 and although there have been years where there was no professional baseball in Nebraska it looks like the future is good with both Omaha and Lincoln hosting teams today. While this is a site dedicated to baseball it is also the story of the communities that supported the teams. It is the story of town boosting, parks burning, owners whining, tornadoes destroying and the ever present optimism that comes with the first call of "Play Ball" in the spring.